Dental implantology involves two major disciplines; surgery and prosthodontics. Dr. Tremblay has the experience and expertise to master both disciplines, which allow him to better plan a treatment that is potentially of optimal result for his patients. At the Tremblay dental implant clinic, you are assured to obtain a precise diagnostic and a complete and personalized treatment plan. At this stage, Dr. Tremblay will complete a case study and provide a treatment plan, taking into account your medical condition, as well as your personal requirements. In some cases, when aesthetics comes into play, we can place an implant and a temporary tooth immediately. As described in the dental implant section, it is at this stage that Dr. Tremblay proceeds to place an implant to replace one or many missing teeth and/or proceeds with the bone graft, if required. Thanks to the numerous advances in the field and the specialized techniques mastered by Dr. Tremblay, it is often possible to restore full dental without proceeding with a bone graft. The prosthetic phase is the implant dental rehabilitation. 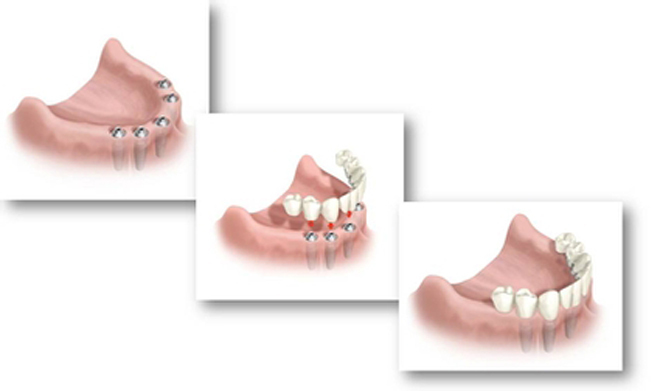 The roots are replaced by the implants and the crowns and bridges are positioned on the implants. For this, one or more impressions are taken at the implant level, the crown or the bridge are then made by a dental technician and are fixed to the implants by screwing or adhesion.